Pingyao was the last (brief) stop on my recent travels around China (Dunhuang and Xi’an were the other two). What puts this Shanxi province town on the map is the well preserved Ancient City (平遥古城 píng yáo gǔ chéng), which was added to the UNESCO World Heritage list in 1997. It is one of the best preserved ancient cities in the world, with a full city wall (built in 1370) which is 12m high (40ft) and 6km around (nearly 4mi), with a total of 72 watchtowers! Outside the walls is a 4m wide moat, and something about the look of the walls and moat reminded me of the moat around the Forbidden City. By the 19th century PIngyao had become the financial centre of China, with as many as 20 financial institutions in the city. Among them was Rishengchang Exchange Shop (日升昌票号 rì shēng chāng piào hào), established in 1823 and considered the first draft bank in China. At its peak it controlled half the Chinese economy. Its main business was cheques (or drafts) for which they developed the most advanced printing in the world at the time – using watermarks. 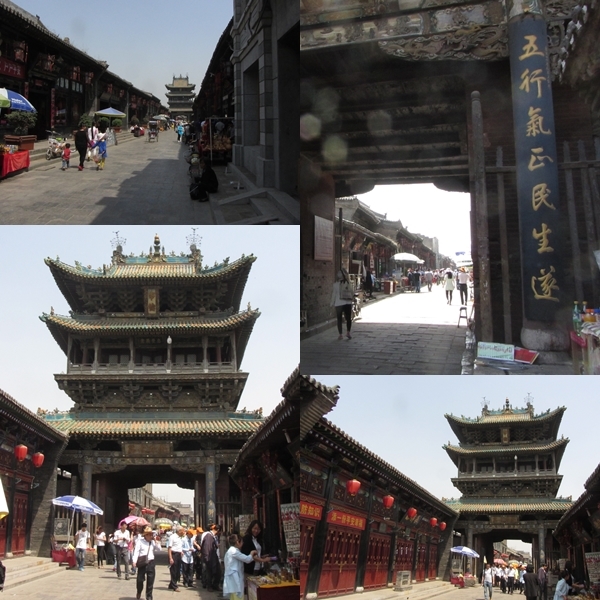 It turned out that we were arriving in Pingyao on “national tourist day” – meaning that there was no admission fee for attractions in the ancient walled city. The place was PACKED with Chinese tourists, but as we were arriving late in the day we were in time to watch busload after busload walking out of the city toward dozens of tour buses waiting for them on the main road outside the gates. It took a while to fight “traffic” up to our guesthouse, located almost dead-centre inside the walls, on a central pedestrain walk filled with shops and restaurants. 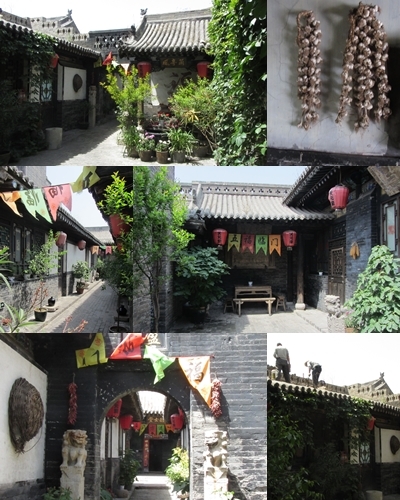 The guesthouse was a series of narrow hutong style walks, winding around in such a way it wasn’t hard to miss a turn. It was really well done – the rooms were nicely renovated but in such a way that they didn’t lose the traditional style of the courtyards outside. The narrow walkways had lots of little touches, with potted plants and wooden chairs, plus dried corn cobs and long lengths of dried chilis and garlic bulbs hung up here and there. Narrow passages and courtyards inside our guesthouse. We dined on local fare – cold slices of corned-style Pingyao Beef, battered tofu, simple vegie dishes, and thick razor-cut noodles – then walked down South Street (also known as Ming-Qing Street) toward the lit up South Gate. The narrow alleys were all grey stone, with wooden facades on buildings and tiled rooves above, plus not a few lit red lanterns hanging here and there. 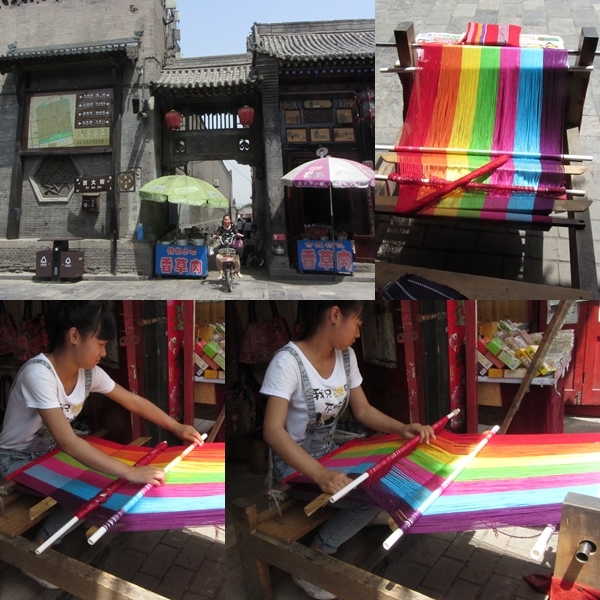 It reminded me a lot of the old town of Lijiang – touristy in a Chinese way. I bought some of the sesame toffee I enjoy (watching the toffee being pulled on hooks was fascinating) and we also munched on crunchy sesame candy. There was even a wonderful light breeze, which helped make it such a lovely night. Looking down South Street toward the South Gate tower. The only downside was that my knees were getting progressively worse. In the morning it was clear I would not be able to visit all the sights I’d wanted to, so I enjoyed a restful morning at the guesthouse. It was sad to miss seeing more of the town, but I wouldn’t have enjoyed it with my legs in that condition and it wasn’t worth a week’s recovery. So I just took a simple wander along part of Qing-Ming street and took a closer look at the City Tower (市楼 shì lóu). At 18m high (60ft) it is the tallest structure inside the city walls. City Tower – in the middle of Pingyao Old City. The buildings are in the old style, but on the main streets most were restaurants, hotels, or souvenir stores, and street food sellers were everywhere. Still, there were private residences here and there, especially down the smaller streets. As I wandered, both at night and the next morning, I looked at souvenir wares and just generally absorbed the atmosphere. One surprise was the amount of vingear being sold – it must be a famous local product. Many stores had huge vats of the stuff, each labelled with a vintage – 10 years, 15 years, 20, 25… Something I particularly enjoyed was watching several women weaving on looms. Hand woven scarves and shawls are one of several local handicrafts sold all over town. 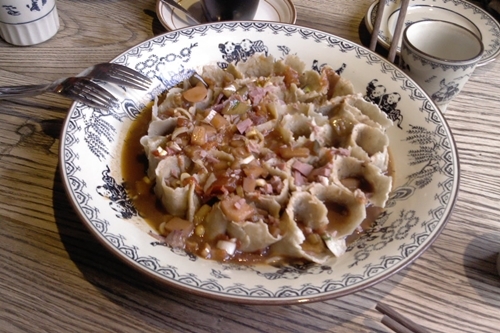 After checkout and lunch (and sampling local speciality: fresh made Mountain Noodles – short, vertical tubes of fresh noodle with a thin tomato/capsicum/potato sauce) we were on our way back to Beijing. First an electric cart to the bus station, bus to Taiyuan, taxi to the train station, and the train back to Beijing. I looked out the train window from time to time for that first hour while it was still light, marvelling at how the Chinese cultivate every scrap of land, raising so many crops in small terraced plots even in what is clearly quite dry soil. But that’s true everywhere I’ve been in China. At that late hour there were still people working in the fields here and there; most seemed to be hoeing new furrows. I also noted a lot of impressive grave stones in and around fields and orchards, most made of dark grey stone and some quite tall (2-3m) with small peaked tile rooves on top. Tomb-sweeping day was more than a month ago but the bright garlands on many of the well-kept graves meant they still looked freshly decorated. A little over three hours after leaving Taiyuan, we were back in Beijing, where the wonderful Driver Shi waited to pick us up. We dropped my friends off at their hutong guesthouse near Tian’anmen and then I was on the way back to my very own bed! Sounds an interesting place to visit.